Stanza, now a universal app for the iPhone and iPad alike, is an e-reader from Lexcycle. Lexcycle, in turn, has been bought by Amazon since our first review of the then iPhone-only Stanza appeared. But Stanza’s feature set differs notably from Amazon’s Kindle app. The most obvious difference is Stanza’s lack of integration with its own dedicated e-book store. 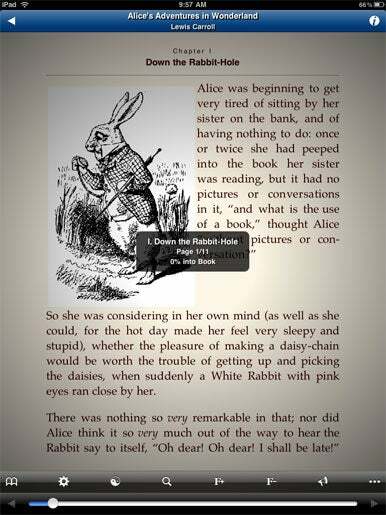 The app connects to a variety of online sources for free and paid books, and can read other books in non-DRM-protected ePub, eReader, PDF, Comic Book Archive, and DjVu formats. 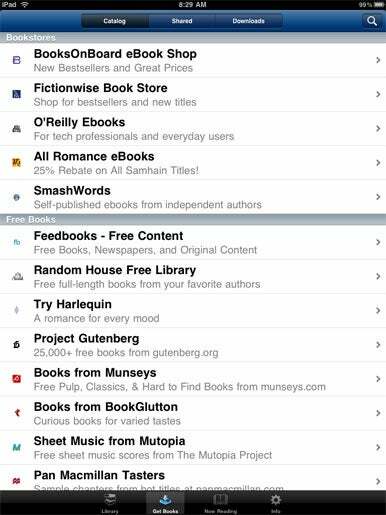 That means you can’t read iBookstore purchases or Kindle store books in Stanza, but you can read free books from Project Gutenberg, the Random House Free Library, and buy books within the app from Fictionwise, BooksOnBoard, and O’Reilly, among others. It’s a far cry from the far more robust Kindle bookstore (with 600,000 titles), or even Apple’s iBookstore (with “tens of thousands” of titles)—but if you can find books that you want to read, that’s all that matters. I do find it annoying that, even when afforded all the screen real estate that the iPad provides, Stanza doesn’t show book prices in most views when you shop—you need to tap into the individual book itself to find out how much it costs. Book-Mobile: Stanza doesn’t have the dedicated e-bookstores that iBooks and Kindle offer, but it does let you read free books from a number of sources. Where Stanza bests its competitors is in its customizations. The app sports impressive display controls: You can choose from more than 40 fonts (although, admittedly, you’ll likely never want to read a book in Marker Felt or some of the other more whimsical fonts offered). You can also adjust not just font size, but also font and background colors. Stanza offers numerous reading themes, all of which you can further customize, saving settings for daytime and nighttime reading. I tweaked both defaults—switching to a sepia-toned background for daytime reading, and dark gray on black for night. Stanza even lets you set a background image, but I can’t imagine most sane readers would go that route. And in a particularly clever touch, swiping up and down on the screen adjusts the screen’s brightness. While all those features are great, Stanza also includes a few frustrations. It’s impossible to leave the app’s controls visible while you read, since that view also superimposes a dark info box smack dab in the center of the text. Kindle and iBooks both allow you to toggle controls in and out of view without obscuring the book’s text. Making this even more frustrating is that that Stanza is a bit sensitive about recognizing center taps; the “touch zones” for pagination are too large for my tastes; if I’m just a hair off-center when tapping and unintentionally turn the page. In Control: Stanza sports impressive display controls, but it’s impossible to leave the app’s controls visible while you read, as that places an info box over the text. On the iPad’s large screen, I find landscape reading unmanageable; the column of text is just too wide to read manageably. Since you can’t set the margins separately for portrait and landscape, I simply stuck with portrait mode for most of my reading. On the iPhone, though, I found a comfortable margin where reading in either orientation with Stanza felt fine. In spite of its minor flaws, Stanza offers a very pleasant reading experience. My general requirement for any e-reading app or device is that it be able to fade away, and not distract in any way from enjoying the text you’re reading—and Stanza certainly passes that test. Regardless of the app I’m using, I much prefer reading on the iPad to the iPhone, but both versions of the app work quite well. The most significant difference between Stanza and its big-name competition is the book-source required. Stanza feels a bit more “do-it-yourself”-focused, since you’ll need to dig a bit more to find books to read. If that approach suits you, Stanza won’t disappoint.